mall Robert Lee, of Virginia, aged five, was playing one day with another boy of his own age, whose mother was visiting Mrs. Lee. The Lees had lived for two centuries in the beautiful brick mansion, "Stratford," on the Potomac River. While the boys played on the veranda, there was the sound of busy feet inside the house, and an air of bustle and hurrying to and fro. Robert knew the cause of this and was feeling very happy. His father, Colonel Robert E. Lee, was coming home from Mexico, where he had done brave things in the Mexican War. The story of this had been in the papers, and though Robert had not seen his father for two years and sometimes could not remember just how he looked, he knew from the way people mentioned Colonel Lee's name that he was a man to be proud of. When Eliza, Robert's black mammy, called him in to be dressed, there was trouble. He would not wear what she had ready for him. He was the Colonel's namesake, and if his father was coming home, nothing was nice enough but his best frock of blue and white. Small Robert had his way about the frock. His hair was freshly curled, and he rushed down to the broad hall, where the family were waiting for Colonel Lee. The lady visitor had pinned a rose in her hair, and the other little boy had been dressed in his prettiest clothes. Pretty soon there were shouts of "Here he comes--here he comes!" and they could see Colonel Lee, in a handsome uniform, riding his chestnut horse, Grace Darling. He sprang from the horse and up the steps, and when he had greeted the older ones, he sang out: "Where's my little boy--where's Robbie?" He seized the child nearest him and kissed him half a dozen times. But it wasn't Robert that he kissed. It was the other boy! For a minute Robert cried, but his father had plenty of kisses for him when he found what a mistake he had made, and he whispered something to Robert that made everything all right. There was a mustang pony on the way from Mexico for his little son! This pony was pure white. A faithful Irish servant taught Robert to ride in a short time, and he was the proudest boy in the world when he rode out on Santa Anna beside his father on Grace Darling. Robert bragged a good deal to his playmates about Grace Darling, because she had carried his father all through the Mexican War and had the scars of seven bullets on her sides. Colonel Lee loved animals and taught all his children to be kind to their pets. When the family lived in Arlington, "Spec," a lively black and tan terrier, went everywhere with them, even to church. Colonel Lee thought he made the children restless, so one Sunday, when they started for church, he shut Spec in a chamber in the second story. Spec looked out of the window for awhile. It was open, and he soon made up his mind that he would rather be with his friends. So he jumped to the ground, ran as fast as he could, and walked into the pew just behind the family. After that he was allowed to go to church every Sunday. Colonel Robert E. Lee was a very handsome man. When he and Mrs. Lee were going out in the evening, the children always begged to sit up and see them start. They never saw any man or any picture of a man they thought so beautiful as their own father. General Lee was not just a good leader of soldiers; he knew how to make everyone mind, and although he was the best playmate his children had, he was very firm with them. No slipshod ways were allowed in his house. No, indeed! If his boys and girls were not tidy about their clothes, faithful in their lessons, polite, and truthful, they found their father stern enough. When their father was so quick at sports and games and could plan such perfectly splendid holidays, it did seem pretty hard to the Lee children that he was so often sent away on war duties. But wherever he was, he found time from his military affairs to write long letters to his children, and these were so playful and told of so many strange things that it partly made up for his absence. The neighboring playmates used to watch for those letters almost as eagerly as the family, and probably they envied the Lee children sometimes when their father came for a visit, wearing some new honor or title. For as he was wise and good and brave, he did not fail to rise higher and higher in rank. His father had been a general under George Washington and had taught his son that there is no grander honor for a man than to defend his country. And in order that Robert should make a fine soldier, he had been trained at West Point. When he had proved how keen and skilful he was, Abraham Lincoln, then president of the United States, asked Robert E. Lee, who had become a general, to take command of all the armies of the Union. 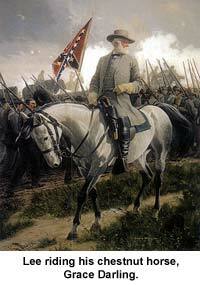 But general Lee was much troubled in his mind. Just then there was danger of the northern and southern States fighting against each other. If the people of the different States should really grow so angry that they came to blows, Lee felt he must stand by Virginia, because that was his father's State. Indeed, the Lees had lived there since 1642, and Robert Lee loved every inch of its soil. He felt sad enough when he found there must be fighting, but he could not accept Lincoln's offer, so he gave up his high place in the United States Army and took the post of Major-general among the Virginian soldiers. Then the Lee family had to do without their father and chum for four long years. They had grown up by this time, and all their childhood pets were dead. Grace Darling's place was taken by Traveller, an iron-gray horse with black points. He was so large and strong it did not seem possible to tire him out. He carried General Lee all through the Civil War. He often went cold and hungry, but he loved his master and would come when he heard the general's whistle or call, no matter how far away he might be. The soldiers loved Lee, too, and they obeyed his slightest wish. The Civil War was long and cruel, as all war is, and at the end Lee had to yield because his men were starving. But he is counted as one of the greatest generals known in history, and his fame will never die. The little Robert E. Lee, who rode the mustang pony, is now a gray-haired man. He has written the life of his father and has told how General Lee became a college president after the War. The students loved their president as well as the soldiers loved their general, and they always felt proud of him as he went galloping past them on dear old Traveller after the duties were over for the day. Good old Traveller deserved a medal, if ever a horse did, for sharing the dangers of her gallant master, General Robert E. Lee.